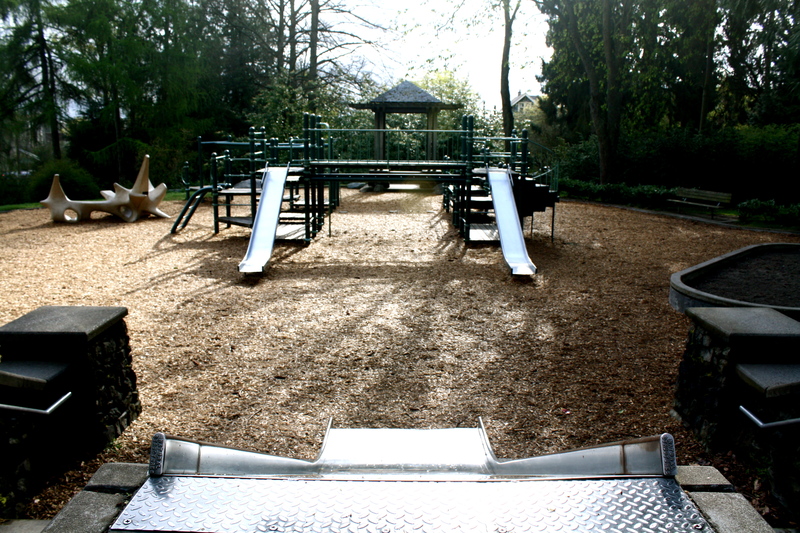 If you remember playing on the Volunteer Park Playground when the equipment was new, you are now officially old. Seattle Parks is beginning the design phase for a planned $800,000 renovation of the playground to replace the aging play structures. You’d better get your fill of the playground this summer. In 2012, it will be closed from spring to fall. “It doesn’t look that bad, but it really needs to be updated and be accessible,” said Emily Fuller, the project’s manager at the Department of Parks and Recreation. The playground was selected after the department conducted a study of all the playgrounds in the city a few years ago. “The ones that were either the oldest or needed updating were prioritized,” said Fuller. So how old is the Volunteer Park Playground? The equipment turns 20 years old this year. The scope of the plan does not include expanding the shape or area of the playground, but Parks will be seeking public input on what kinds of equipment should be installed. The first public meeting has not yet been scheduled, but it should be in early June. Construction is scheduled to start in March 2012 and be finished by September, according to the project webpage. $800,000 has been allocated for the planning, design and construction of the new playground — though the sign posted at the park says the amount is $600 grand. We’ll check with Parks to ask about the gap. The renovation project is funded by the 2008 Parks and Green Spaces levy. For an example of a recent $300,000 parks playground project, here’s what the community organized to build in Seward Park. With more than twice as much to deploy, we’ll be interested to see just how impressive the new Volunteer Park playground will be. In other Volunteer Park news, Friends of the Conservatory at Volunteer Park is holding their annual meeting at 6 PM Thursday down south at the Mount Baker Community Clubhouse (2811 Mt Rainier Drive South). Here’s more info via Facebook. We’ll have more about the financial situation around the organization which has been feeling the pinch of ever-shrinking parks operation budgets. The Friends of the Conservatory at Volunteer Park request your presence at our 31st Annual Meeting. Please join us to hear about the triumphs of the past year, and the challenges yet to come. For questions contact foc@volunteerparkconservatory.org or 206.322.4112. Gosh, I don’t know, that’s an awful lot of money for some playground equipment. What is there now seems ok, and the play area does get alot of use…at least on sunny days. I question if this is a good use of taxpayer money. Umpqua Bank might give them the $10,000 they are trying to give away. You will note that the money for this is taxpayer approved. So question it all you want but the taxpayers have already said it is a good use of taxpayer money. This is great news, that playground is pathetic. It gets tons of use and is one of the saddest play areas in the city. As for folks who think this is a waste I was just in the bay area and watched Obama spend a good $3 or 4 million of your money so he could go have a meeting at Facebook and host 4 fundraisers one of which cost $35 grand a person. And this type of waste has gone on for decades at the Federal level. So wake up already sheep. Our busses are servicable. They shouldn’t be replaced. Our roads are servicable. We shouldn’t be filling pot holes. My car is servicable. I don’t want my tax dollars going to light rail. And, I don’t care about the Conservatory. I’d rather have a new slide. Perhaps people are reacting to the fact that it’s hard to imagine how to spend this much money on a playground. Suppose you were a commercial builder and you wanted to build a house on that area with a nice landscaped garden. Do you think you’d budget $800,000 dollars for that work? Do you think the cost in labor and materials of building a house and landscaping the yard is more or less than the labor and materials necessary to upgrade a playground? If they’re really going to spend that much, there’d better be diamonds on the swings when they’re done. Also worth considering: there are malaria swamps in the middle of the path on the west edge of the park that would take a couple of hours and $50 of materials to fill in. Why spend so much money to fix something that works, when there’s stupid issues like that not dealt with? Finally what are the chances that this upgrade will actually take the playground offline for 2 years, and bring with it noise and pollution? Pretty good I’d say. …it needs to be updated to be safer and no fun. Toot sweet. I would love to see this sort of project made into a real benefit to the community by hiring folks who need the work. There are plenty of out-of-work construction workers who are capable, many of whom have become homeless in the last few years. Surely the city could see fit to make an example of this project by hiring a competent project manager who can then pick his or her crew by going through local employment agencies (DESC’s Connections programs, for example). So often the general public will grouse about capable people who are homeless, but where are the jobs? This is an instance where the city could give a real opportunity to folks who haven’t been in the job market for awhile. I get that there are many details (insurance, training, accountability) that I’ve glossed over, but the CCC and WPA worked back in the day- why not now? We arrived here in 1982 with a toddler and were frequent visitors to the playground back then: play area was smaller and the toys were less fancy, but it gave the impression of having been there for ever even then. There was a truly giant geodesic climbing frame, some smallish wooden climbing structures AND the white concrete spiky thing that is visible in the upper left of the photo above (and is the only remaining item, other than the wading pool and the bathrooms, from the early 80’s). As I recall the white spiky thing is dedicated to a (school?) librarian – go read the plaque on it. Um, no. It would take a lot more than a couple hours and $50 worth of materials to fill in the “malaria swamps”. From what it sounds like you are saying, you just want to dump material in the hole and move on? It does not work that way, if you filled in the hole you would just create a barrier that would allow water to move laterally, and likely increasing the size of the “malaria swamp”. @engineer – maybe you’d like to provide a rough estimate for the cost of fixing the swamp? Would love to see what’s there kept and maybe regrading and adding on to the eastern side. Generally speaking there is a lot to do there for the little ones, and what’s there seems to be in fairly good condition. I do like the mats at cal anderson, maybe something like this could be in the works. I live nearby and think the play area is in need of an update, but the price tag seems a bit outlandish for what should be needed. Taking some of that money and investing it in updating the stage, including sound equipment, I think would be a great addition to the park for kids and grown-ups alike for plays, concerts, movies, etc. on the park lawn. Actually, although I am single, I welcome families and children on Capitol Hill, and am happy to see that there are more of them in recent years…..great trend! When I was in high school (about the time this equipment was being installed, yet I still don’t feel “officially old”) my volunteer group teamed up with the local Kiwanis to raise money for new playground equipment in my small town’s main park. We had raffles, bake sales, etc. and raised the money. The Kiwanis bought the equipment and we spent a couple Saturdays pour concrete, shoveling sand, and assembling the thing. I was a good way for teens in the community to give something back, and to learn to work with adults on a good project. Raise a little sweat, a few blisters, and some sense of ownership. I don’t want to sound like too much of a fuddy-duddy, but would something like that be workable? I’m sure there are liability issues with non-professional labor, but if there was a community need for this equipment to be fixed, it would have been nice to see the community leading the charge. Idontgetit: I voted for the 2008 parks levy, but like most voters I was not as informed as I should have been about the details of what was to be spent where. I tend to trust city officials to know how to wisely spend the money we voters approve, but in this case I think my trust was not warranted. If I had known then that $800,000 was to be spent on this play area, I would have voted against the levy. I’m going to be more careful and circumspect in the future. I’m not opposed to some modest improvements to that play area, but $800,000 is ridiculous. So, based on that, we should be expecting to get at the volunteer park site a 4 acre, edgy and awesome playground with 2 story climbers, a variety of slides, a bathroom that looks like a castle, several blacktop areas for hoops, 2 trike trails, a wading pool, bbq pits & picnic benches, a firetruck and house and rocket capsule to play on, and a giant climbingrope spider web. …but, let’s be realistic: I’d bet that the safe money would be on nothing more than a single cheapass cop-out cookie-cutter climber and a rubber floor. then again, St Edwards state park playground (kenmore/juanita) was built in a single week, by an army of 2000 volunteers, using ZERO state funds. It’s consistantly rated among the top 5 BEST playgrounds in the area and holds the title as THE largest playground in the state. It’s also the most accessible. So, you know, take note SP&R: money isn’t everything. Update: Construction actually starts after the wading pool is closed. September/October for construction to be opened in November. The full amount is $800k, but the project manager, Emily Fuller, is keeping the budget at $600k so she can divert funds to other projects. At least that’s how I understood it from the conversation I had with her. Additionally, the “Friends of Olmsted Parks and Seattle Landmarks Architectural Review Committee” will ultimately be responsible for what is approved for the space. From what I gathered, the committee will want something that “fits” into the Olmstead Legacy (read: aesthetics over function). Reading between the lines this means we won’t have anything particularly innovative, will likely made out of wood, and approved by people who haven’t raised a child in a couple of decades. I had high hopes coming into the project and I attended the public meetings in 2011 to make suggestions and listen to the other families. Sadly, the attendance was pretty awful (maybe 30?) and it didn’t seem like many, if any of the suggestions, would become reality. I have 3 children who will enjoy the new park regardless how it turns out. However I had hoped for a more collaborative and innovative effort for the budget.